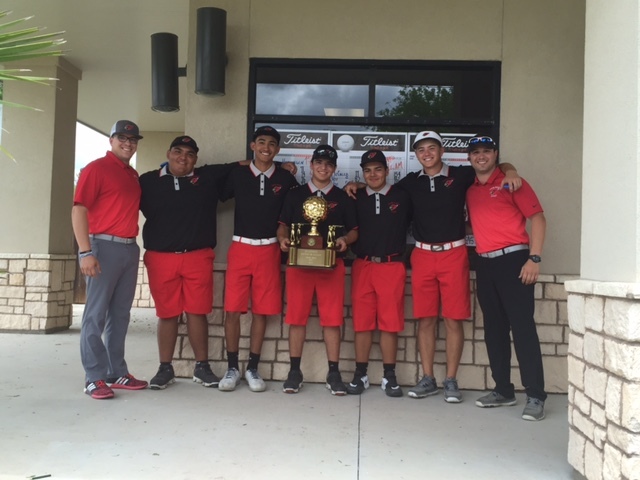 The Harlingen High School Cardinal Golf Team won the 32-6A district title on Tuesday, April 11 after shooting a season-best 294 on the last day of the competition sealing a 50 shot victory over the rest of the field. Senior Cole Charvat captured the second place medal with rounds of 74-71 while teammate Dylan Martinez, a Junior, finished right behind him with the third place medal shooting 73-74. Sophomore, John Ortega also finished as the fourth place medalist with rounds of 75-76. Sophomores Nicholas Galvan, 82-73, and Sammy Rios, 94-91, also played well contributing to the team’s commanding victory. The Cardinals will head to San Antonio at the end of the month to compete in the regional golf tournament and attempt to extend their season. Sophomore, Micaela Leandro also advanced to regionals as an individual finishing in the top five for the tournament with rounds of 86-76. This is her first regional appearance. So proud of these boys and coaches!!! Proud Mommy! Congrats to the HHS Varsity Golf Team and the fantastic coaching staff…way to go Milligan!